We believe that all students are talented and all students have gifts. Our goal is to develop the gifts and talents of all students. “Gifted” is a specific education term that applies to a small percentage of students who show exceptional aptitude, meaning they exhibit an ability to grasp concepts that have not yet been formally taught. The St. Paul the Apostle Catholic School TAG program documents and facilitates program modifications for students identified as having exceptional aptitude, modifications are made within the regular educational setting, rather than pulling students from class. At the present time there is no universally agreed upon answer to this question. Giftedness, intelligence, and talent are fluid concepts that fluctuate depending on the context and culture. Even within schools, a range of personal beliefs about the word "gifted" may be found. According to The National Association for Gifted Children (NAGC), "A gifted person is someone who shows, or has the potential for showing, an exceptional level of performance in one or more areas of expression. “Gifted and talented children” are those children who are identified as possessing outstanding abilities and who are capable of high performance. Gifted and talented children are children who require appropriate instruction and educational services commensurate with their abilities and needs beyond those provided by the regular school program. Bright or high-achieving students are often "rule followers". They are able to read situations, know what is expected, and carry out expectations to a high level. These students often get high grades, complete all work, and are excellent citizens. Gifted children can be "rule benders" or push the envelope of expectations. They are highly curious, want to know why, feel they are beyond others, are good manipulators, may see rules or guidelines not applying to them, and are often unorganized. This may impede their performance. Every gifted student is unique. St. Paul the Apostle Catholic School believes all students are gifted in various and unique ways, and provides a variety of enrichment opportunities for all students. With this belief in mind, the TAG program will formally identify academic giftedness based on the screening protocol. A request for screening may be submitted by a parent, teacher, school counselor, the building TAG coordinator, or a school administrator. A formal “Request for Screening” packet includes the official request form, an observation form completed, as well as any supporting data he or she wishes. 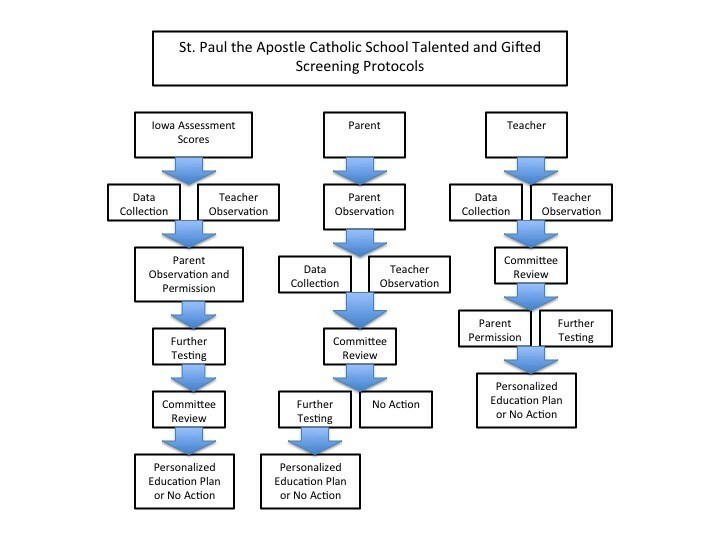 Once the request form and any supporting evidence have been submitted, other sources of data are collected by the classroom teacher and/or the building TAG coordinator to create a portfolio supporting the screening of students for possible gifted and talented identification. The portfolio is designed to provide a holistic look at each student’s strengths and needs, based upon on the age and grade of the student. The screening committee then meets to examine all submitted portfolios, determines which students’ needs are already being met in the regular classroom, and is a Personalized Education Plan would be beneficial for the student. In all cases, programs and services are determined by need and potential benefit, not the identification. Iowa Assessment scores in the 97th percentile or above on the Iowa Assessment in Reading, Math or Science are one piece of data for the portfolio. Classroom teachers differentiate instruction based on the Thomlinson model of differentiated instruction. Learning is differentiated by content, process and product helping each student to obtain their full learning potential. Below are examples of differentiated instruction. With the belief that all students are gifted in their own unique ways, St. Paul the Apostle School provides the following Enrichment Programs that are available for all students, some at specific grade levels and others are open to all grade levels. St. Paul the Apostle School offers course level and grade level acceleration based on individual students needs. Course level acceleration is most predominant in our Math program, as each year 8th grade students may qualify to attend Assumption High School for Algebra. Other course level acceleration may be part of a student’s Personalized Education Plan. Grade level acceleration is also an option as part of a student’s Personalized Education Plan. Grade level acceleration requires additional data using the Iowa Acceleration Scale, not only taking into account the student’s academic needs, but also their social and emotional needs and maturity. The Illinois Association for Gifted Children is just one of many state-centered organizations for gifted kids. Parents can join, find other families, and even attend special events. The Gifted Child Society is a nonprofit organization dedicated to furthering the cause of gifted children. Through their website, parents can find helpful information and learn about seminars and workshops they can attend. The Governor’s Program for Gifted Children is a seven-week residential summer enrichment program for gifted students. Parents can learn more about the program, held at McNeese State University, from their website. SENG is short for Supporting Emotional Needs of the Gifted and is an organization that wants to help ensure that gifted children are understood, accepted, nurtured, and supported by their families, schools, and workplaces. Mensa embraces younger members through this fun website, offering up monthly themes to get kids reading and learning at an advanced level. Find out more about the latest research being done into academic acceleration through this organization’s site. Located at Johns Hopkins, this organization engages gifted kids and their families through programs, summer classes, and even a bi-monthly magazine.